Hybrid vehicles are on track to achieve record U.S. sales this year despite signs consumer interest in hybrids is waning, an auto information company said Thursday. An estimated 187,000 hybrids were sold in the first six months of 2007, accounting for 2.3 percent of all new vehicle sales, according to J.D. Power and Associates. Although a slowdown is expected in the second half of the year, J.D. Power is forecasting total sales of 345,000 hybrids for 2007, a 35 percent increase from 2006, when the current record of 256,000 hybrids were sold. 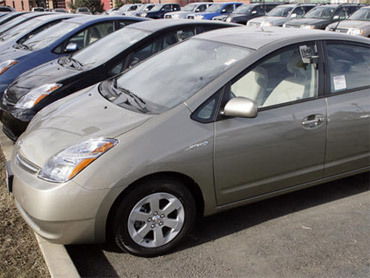 The Toyota Prius continues to be the best-selling hybrid model, accounting for just more than half of all hybrids sold. J.D. Power said Prius sales got a boost this year from incentives of up to $2,000 per vehicle, which helped offset a decrease in federal tax breaks for Toyota and Lexus hybrids. Toyota Motor Corp. said Wednesday that Prius sales were up 85 percent in the first seven months of this year compared with the same period a year ago. Mike Omotoso, senior manager of global powertrain forecasting for J.D. Power, said the percentage of people who say they're considering hybrids is dropping as buyers realize the vehicles may not save enough fuel to justify premiums of up to $3,000. "Toyota is realizing that. That's why they're offering incentives," he said. Hybrids also face growing competition from other fuel-saving technologies such as diesel and ethanol. Omotoso predicts an influx of diesel vehicles from European automakers in the next few years. Honda Motor Co., which is discontinuing the hybrid version of the Accord sedan because of weak sales, plans to introduce new diesel-engine technology by 2010. Omotoso expects U.S. diesel sales to top 500,000 in 2007. Competition within the hybrid segment also will intensify in the coming years, giving buyers a lot more options. There will be as many as 65 hybrid models, more than half of them trucks, in the market by 2010, with projected sales of nearly 775,000, J.D. Power said. Later this year, a two-mode hybrid system developed jointly by General Motors Corp., BMW AG and DaimlerChrysler AG will begin appearing in some trucks and sport utility vehicles. The system uses a computer to choose from thousands of combinations of running on one electric motor, two electric motors, a combination of electric motors and the gasoline engine, or shutting down some of the gas engine's cylinders. Omotoso estimated that the system costs between $6,000 and $10,000, so the manufacturers could have a difficult time making money on it unless consumers will pay a premium.